HAPPY BIRTHDAY BEV - have a fabulous day. Love ya lots. Today is my daughter-in-law's birthday, she is one of my crafting buddies -well for shopping anyway. This is the card I made her. The image of this card is a La Blanche stamp, Bev seemed to fall in love with these when we saw them at the Craft Show on Saturday. I used Clarity card and inked it using tea dye and antique linen DIs splattered with frayed burlap and water to give it the aged effect. I edged it with watered down walnut stain and also diresct to paper in the same colour, then with diamond stickles. I chose to use 3 DPs (sorry only know the name of one which is a Laura Ashley strip). All three were inked with walnut stain and I sewed the strips to the backing paper. The flowers I made using those papers and some others from my box of bits and I used a Crealies die and 2 punches for the petals which were soaked in paper, inked, dried, assembled and glittered. They really look quite shabby. 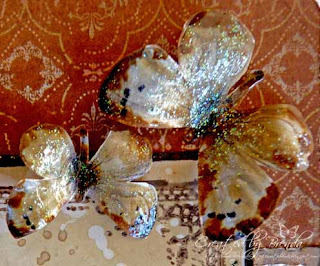 The butterflies are white downloaded images and I used my new walnut stain distress stain and dabbed it on the edges, then used antique linen, frayed burlap and water to paint in the rest of it. When they were dry I covered them with glossy accents and sprinled in some glitter. I added some brown ribbon and made the sentiment using a new Anna Griffin stamp. The scalloped card is also new, bought on Saturday at Farnborough. I think I have covered all the shades of coffee and cream. I really like the effect. Have a fabulous week ahead and thanks for taking a look at my work. Wow, what a stunning card Brenda, those butterflies and flowers are gorgeous,your daughter in law will love it. Congrats on the honourable mention. Hi Brenda - wow those colours are gorgeous . Lovely Brenda. What an absolutely stunning card, the flowers are just gorgeous. What a gorgeous card! One has to keep looking at it to make sure you don't miss anything. Those flowers and the butterflies.....WOW! Your daughter in law will be so pleased. Have a great day. Gorgeous card Brenda. Love the colours and beautiful flowers! Truly fab Brenda, I just love those flowers & butterflies. Brilliant! WOW Brenda this is FAB! I love the hand made flowers but the hand made butterflies are AMAZING its hard to believe they started out as white paper!! How could anyone not love this card? It's absolutely scrumptious! She'll love it. 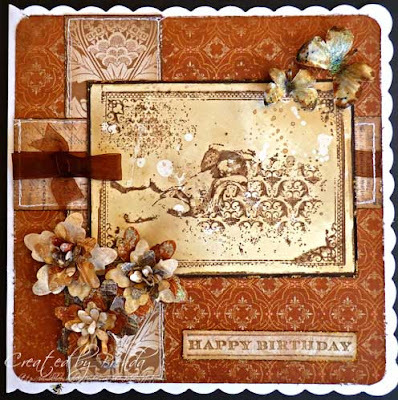 What a GORGEOUS card, Brenda!!! And I know she will love it!!! This is fabulous! The flowers and butterflies are goregous. Thanks for playing along with us at Tuesday Throwdown. Gorgeous card and Fabulous Butterflys and Flower.Thanx for joining us at Crafts and Me. O wow Brenda, I love this one especially those flowers and the butterflies ...... who would have thought they were white downloaded images!!! Awesome!